Sparkles and glitter, oh my! Whoever said that glitter doesn’t bring happiness? No one! 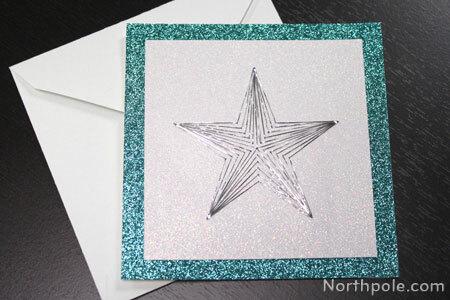 On this card, the aqua glitter paper really brings out the sparkles of the white glitter paper. 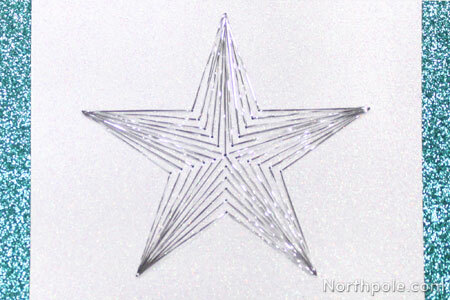 If that were not enough, there’s the metallic star. GLAM SLAM! This glitzy Christmas card will brighten anyone’s day (no pun intended). Before you make a gazillion of these, keep one thing in mind—square envelopes require additional postage. Print the template and cut out. 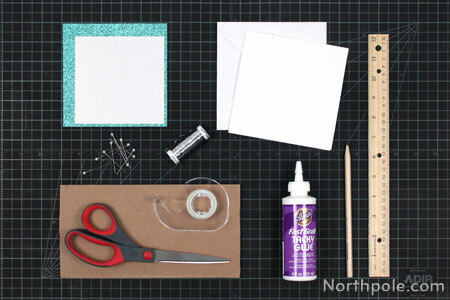 Stack the template and the 4.5" white glitter square together and place on the scrap piece of cardboard. 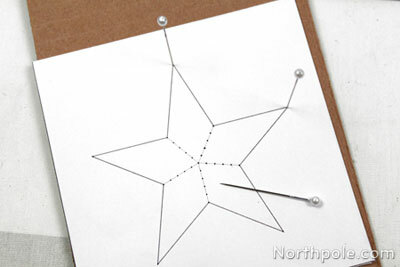 Using the pin, punch holes in the star at each dot. Set pin and template aside. Note: Use a couple extra pins to hold the paper in place while you punch the other holes. Cut a length of thread about an arm span long. Thread the needle, and bring the ends of thread together. 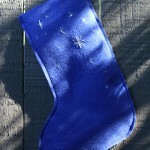 Note: The silver thread is a little springy, so hold the stitches as you sew to keep them from coming loose. As you run out of thread, tape the ends down. Repeat steps 6–9 until you finish the star. Glue the star paper in the middle of the aqua square. Glue the aqua square on the front of the blank card. Now your card is complete. We just love how sparkly this card is! Stamp “handmade with love” on the back of the card.